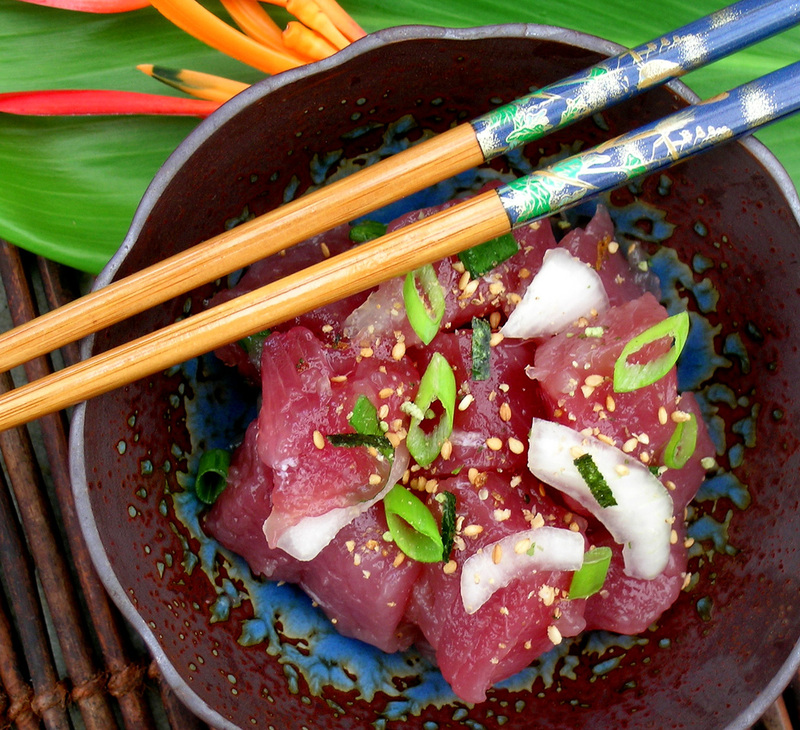 In Hawaii, yellow fin tuna is called ahi tuna. It is among the larger tuna species, reaching weights of over 400 pounds, but is significantly smaller than the Atlantic and Pacific bluefin tunas, which can reach over 1,000 pounds. Most of the ahi that is caught is canned, but the sashimi marketplace demands high-quality ahi. This market is primarily supplied by industrial tuna longline vessels. In Hawaii, Tahiti, and other Pacific islands, small boat fishers supply local and in some cases foreign markets with fresh ahi. Sport fishing for ahi is very popular in Hawaii. Pound for pound, ahi is the fastest and strongest of all big game tunas, and is also highly prized for its culinary qualities. Ahi can be cooked in a variety of ways, seared, baked or poached, but in Hawaii it is mostly eaten raw in sushi or poke. It is low in fat, but high in protein. Ahi has got to be one of my favorite foods. Poke has to be the most popular way to eat ahi tuna in this state. There are many different varieties of poke depending on who is making it. This dish is so popular that there is a poke festival held every year, here in Hawaii, competing for the best poke recipe thanks to Chef Sam Choy. Poke is considered to be "Hawaiian Sole Food". Carpaccio is an Italian appetizer made of raw meat (such as beef sirloin, veal, venison, salmon or tuna), thinly sliced or pounded thin. Naturally with all of the tuna in Hawaiian waters, why not use it. Carpaccio preparations are varied, but the thin meat is usually served on a bed of arugula. Here we make an arugula vinaigrette to flavor and decorate this beautiful dish, along with a few Japanese seasonings. Place a bowl of ice water near the stove. Blanch the arugula leaves in boiling water for just a few seconds. Drain and shock the arugula in the ice water. Squeeze out excess water and chop the arugula into small pieces. Place chopped arugula in a blender. With the motor running, slowly add 1/2 cup olive oil, puree until smooth. Scrape the puree into a bowl and stir in the rice wine vinegar (making it as acidic as you like) and salt to taste. Place in a plastic squeeze bottle with a small tip. This step can be done a day ahead of time, just refrigerate the vinaigrette until needed. An hour or so before serving this dish, prepare the tuna. Going against the grain, slice the tuna into 4 pieces. You can also have your fishmonger do this for you. After folding one of the pieces of parchment in half, use 1 teaspoon of the olive oil to lightly oil the inside. Place one of the pieces tuna in the center of one half of the parchment. Re-fold the parchment and pound tuna with a mallet or the underside of a heavy saucepan until it is paper-thin. Repeat with remaining pieces of tuna. Store tuna in refrigerator. Open the parchment packages of tuna and invert a piece of tuna on a chilled salad plate with the parchment paper on top. Carefully peel away the parchment, leaving the tuna on the plate. Repeat with remaining pieces of tuna on separate plates. Drizzle the tuna with 1 teaspoon virgin olive oil, sea salt, and 1/2 teaspoon furikake. Place five small dots of the arugula vinaigrette around the perimeter of the fish. Repeat with each serving of tuna. Toss 1/2 cup of the shelled edamame with more arugula vinaigrette and place a small mound atop the center of each tuna. Garnish with a lime wedge and serve. Makes 4 servings. On Moloka'i, ahi tuna is common in our small grocery stores. The price varies depending on which part of the tuna you buy. The best part is called the "block", or sashimi grade. This cut is incredibly tender, and is the cut that sushi bars use. Although I don't usually cook tuna unless it is for a Tuna Salad Niçoise, the quick searing in this recipe actually helps to adhere the sesame seeds to the meat without drying it out. Mix both sesame seeds and the salt in a plate big enough to fit the tuna block. Coat the entire outside of the tuna by pressing it into the sesame seeds until the block is completely covered. In a pan, add enough oil to just coat the bottom of the pan and preheat the pan to medium-high heat. Sear the tuna block for about 45 seconds, but no more than 1 minute, on each side. With a sharp knife, slice the tuna block up into 1/4 inch pieces and serve on a bed of dressed watercress. Serve Tamari sauce in a small bowl, with a dab of wasabi paste, and sweet pickled ginger on the side. Makes 2 beautiful appetizer servings. Temaki ("hand roll") is a large cone-shaped piece of nori (a dried edible sheet of algae) on the outside and the ingredients spilling out the wide end. It is typically about 4 inches long, and is eaten with your fingers. Hand rolls can be filled with a variety of ingredients depending on what you want in them. Mixing spicy tuna with avocado makes a delicious combination. To make sushi rice, use short grain rice which gets slightly sticky when it is cooked. Long grain rice wont work for sushi because it has less starch and doesn't stick together. Add 1 cup of short grain rice to a pot with 2 cups of water. Bring to a boil, cover and reduce heat and simmer on low heat for 20 minutes. Let rest covered for 5 minutes, then stir to fluff up the rice. Combine 2 tablespoons of seasoned rice vinegar, 1/2 tablespoon sugar and 1 teaspoon salt. Pour this over the rice and mix together well. Let sit uncovered until cool, about 1 hour. Stir the tuna, spicy mayonnaise, green onions, lemon juice, soy sauce and sesame oil in a small bowl to blend. Place one nori sheet in a dry hand. Wet the other hand and pick up a small handful of cold sushi rice (about a generous 1/3 cup) and spread the rice evenly over the left half of the nori. Using moistened hands will help prevent the rice from sticking to your fingers. With a finger, spread a thin line of wasabi evenly down the center of the rice. Mound a fourth of the tuna mixture down the center of the rice. Top with 1 avocado slice and a fourth of the cucumbers. Beginning with the covered side, roll the nori around the filling at a slight angle to achieve a conical shape. Repeat with the remaining nori, rice, tuna mixture, avocado and cucumbers to make 4 rolls total. Makes 4 handrolls. Steak tartare is a meat dish made from finely chopped or minced raw beef. The term 'tartare' has been generalized to other chopped raw meat or fish preparations, including venison, salmon, tuna, goat, and lamb. The name is a shortening of the original "à la tartare" or "served with tartar sauce," a dish popular in the 19th and early 20th centuries. Cut sashimi grade ahi tuna into 1/4 inch diced squares and set aside. In a bowl, mix together wasabi paste, mayonnaise, Sriracha hot sauce, and sesame oil until blended. Mix in the minced sweet pickled ginger finely chopped green onions, and Tamari sauce. Finally, gently mix in the ahi tuna. Taste the tatare and adjust the seasoning if necessary. To serve, put one tablespoon of tuna tartare on top each cracker and top it off with a cilantro leaf. Another topping idea would be to use the raw yolk of a quail egg. When you get that craving for poisson cru, you don't have to go all the way to Tahiti, try this recipe, it's easy, authentic, and delicious. Place cut tuna in a large, non-reactive bowl. Sprinkle a pinch of salt over the tuna. Pour over the lime juice, give it a gentle stir, and allow it to marinate 5-10 minutes. Add vegetables and chilies, season with pepper and pour over coconut milk. Gently fold mixture. Taste and correct seasonings, then cover and chill. Garnish with green onion and serve. Variations: Add grated or shaved carrots, diced or shaved red onion or sweet onion, a little minced garlic and/or a pinch of sugar. Makes 6 servings. This recipe can be used with almost any large fish from Moloka'i waters, and is a potluck favorite at luaus here on island. In a bowl, combine mushrooms, onions, crab, onion soup mix and enough mayo to moisten all the ingredients. Place raw ahi filet in baking pan and pour ingredients over. Cover with foil. Bake at 350˚F for 45-60 minutes. Remove foil, and broil until lightly brown on top. Garnish with sliced green onions, and serve with white rice, and a nice green salad on the side. Makes 2 servings. Put the olives, capers, garlic, anchovies, red pepper flakes and 2 tablespoons olive oil in a food processor. Pulse just until coarsely mixed. Transfer to a bowl, cover and set aside. Bring a large pot of salted water to the boil. Add the linguini and cook until al dente, about 6 to 8 minutes. Pour through a colander to drain. While the spaghetti is cooking, heat the remaining 2 tablespoons olive oil in a large pot until it shimmers. Add the olive-caper mixture and the tuna. Sauté for 2 to 3 minutes, until tuna just begins to lose its pink color. Add the tomato sauce to the tuna and cooked until heated through. Add the spaghetti and toss to coat with the sauce. Divide among warm pasta bowls and garnish with the chopped herbs and cheese before serving. Makes 4 servings. With "FRISÉE", Bitter Is Better! POMELO... The Granddaddy of Grapefruit!